“Thousands of Christians have fled Iraq’s second-largest city as an Islamist terror group solidifies its control over Christianity’s main remaining stronghold in the struggling nation. The Islamic State of Iraq and the Levant (ISIS), an Iraq and Syria-based Sunni offshoot of al-Qaeda, took over Mosul (pop. 1.8 million) earlier this month, the BBC reports. 2. Give. When it comes to crises like this, sufficient resources are critical. Please read the entire stories below. Let’s pray for our brothers and sisters, both young and old, as many are suffering even now. 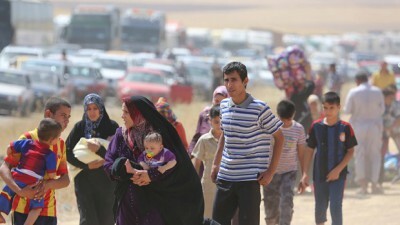 Thousands Flee as Terrorists Take Over Iraq’s Christian Heartland | Gleanings | ChristianityToday.com. Iraq: Hell has broken out here and nobody cares. The Radical.net Blog » Iraq.